For lightweight presentations in the office and around town, nothing works better than the Briefcase table top displays with its’ convenient handle which allows you to maneuver around with ease from appointment to appointment and still maintain that professional image when you walk in. 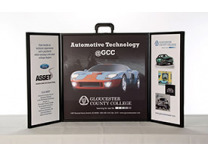 The briefcase table top displays come with fabric panels that are Velcro receptive and a stylish header to command even more attention with each presentation. 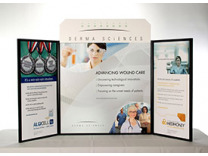 Go first class with your portable displays without the expense. 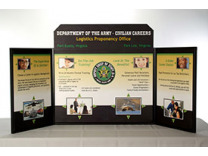 Briefcase style table top displays are great for a wide variety of applications, but remember that genereous discounts are offered on large volume purchases for corporate clients who send large sales teams out into market for short presentations. 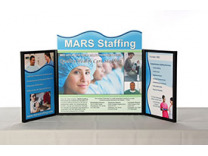 So, kick your trade show displays program up a notch and explore the advantages marketing with the Briefcase Table Top Displays. Classic Exhibits has created several new outstanding products in the past few years that capitalize on lighter weight materials such as extruded aluminum and dye sublimation fabric, to bring new high demand products to the trade show display industry. What moves did they make to succeed during a time where little new innovation was coming out in the trade show industry? Classic saw that there were several shapes of aluminum extrusions that that they already purchased that gave them an extraordinary large amount of linear feet of metal per dollar when compared to other shapes. Their ingenuity and resourcefulness have spawned several entire series of custom modular hybrid displays and given the market something new to look at. Heading the list of new custom modular hybrid displays is the Perfect 10 followed by the Magellan Miracle and Sacagawea tension fabric displays. For the resellers of Classic Exhibits products, the future looks bright due to the creativity and ingenuity on Classic’s part, and some great marketing through an online program they created called exhibit design search, which is an online search program for trade show exhibits which we utilize extensively on the ShopForExhibits.com web site. 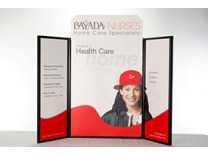 As a long time retailer of products related to trade show displays, ShopForExhibits has extended their product lines to include new product offerings in the premium pop up displays line, along with additional products in the retractable banner stands line. To keep pace with the business activity they forecast in the future, ShopForExhibits.com has recently gone live with an entirely new web site which presents prospective clients with an elevated level of product support along with product videos and graphic templates. As a result of the current economic climate, that is anything but predictable, online retailers have to be flexible in what they offer exhibitors as well has being aware of the declining price point that companies are able to pay for trade show related products. Being successful in any business climate requires a high level of product knowledge and marketing skill in order to successfully be able to bring the next generation of trade show exhibit products such as silicone edge graphics, to the exhibiting business community.